The Department of English and Foreign Languages and the Association of College English Teachers of Alabama (ACETA) are presenting ACETA’s annual conference on March 1-2. The conference offers an opportunity for all Alabama college English faculty and students to present their scholarly work as well as hear from nationally recognized scholars. 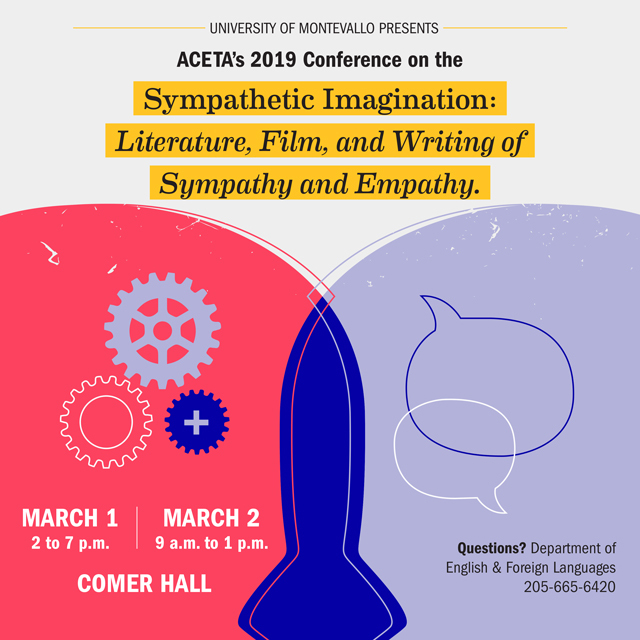 This conference broadly considers literature, film, and writing treating the importance of sympathy and empathy. It is not only limited to literary, linguistic, or phenomenological studies; papers and presentations will include pedagogy, composition, and rhetoric. ACETA encourages research, investigation, and experimentation in the teaching of English, and makes efforts to integrate and coordinate the efforts of collegiate-level instructors of English. The annual conference is a powerful tool to connect students, instructors, and others concerned with the instruction of English in Alabama institutions of higher education. The overall goal is to improve the quality of instruction in English at the collegiate level in Alabama. The conference will be held on March 1 from 2-7 p.m. and March 2 from 9 a.m. to 1 p.m. in Comer Hall. For more information, please contact English and Foreign Languages at 205-665-6420.